Small bathrooms aren’t the easiest spaces to work with. They’re usually cramped and crowded, with limited natural light and awkward layouts. Whether it’s your powder room or your apartment bathroom that’s cramping your style, here are a few tips for making any small bathroom seem bigger — no wall demolition required. Bring in as much light as possible. Light, bright rooms always feel more spacious than dark and drab ones. Wall color. Paint the walls and ceiling the same light color to make the bathroom feel double its size. Multiple colors chop the room into different compartments, making it seem smaller. Windows. If you have a window, use sheer window coverings to maximize the natural light. Lighting. Install additional flush-mount wall or ceiling light fixtures to increase the light in the room. Install larger — and more — mirrors than you typically would in a bathroom. The reflected light will open your small space into one that feels more spacious. Keep all storage as flush with the walls as possible, because anything that sticks out will chop up the space and close it in. Install recessed shelving and medicine cabinets instead. Nothing crowds a space faster than clutter. A good rule of thumb: If you don’t need it there, store it elsewhere. Pare what you keep in the bathroom down to the bare necessities. Raise your shower curtain bar all the way to the ceiling — it’ll draw your eyes up and make the ceiling seem taller, creating the illusion of a larger space. The same goes for any window treatments. Raising sheer curtain panels to the ceiling also creates the illusion of a larger window, making the small bathroom seem larger. Having a bathmat on the floor all the time can make your bathroom feel smaller. 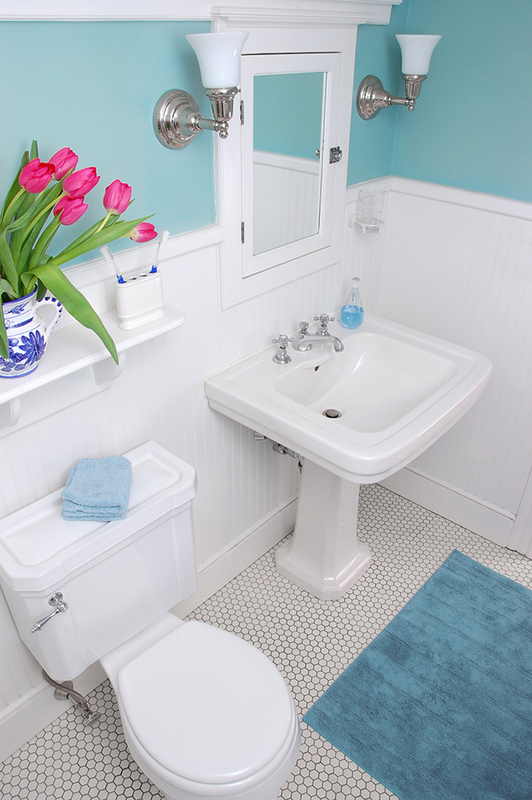 Put your bathmats away when you’re not using them to expose the flooring and make the space appear larger. Swinging doors can take up almost half the room, depending on how small the space is. 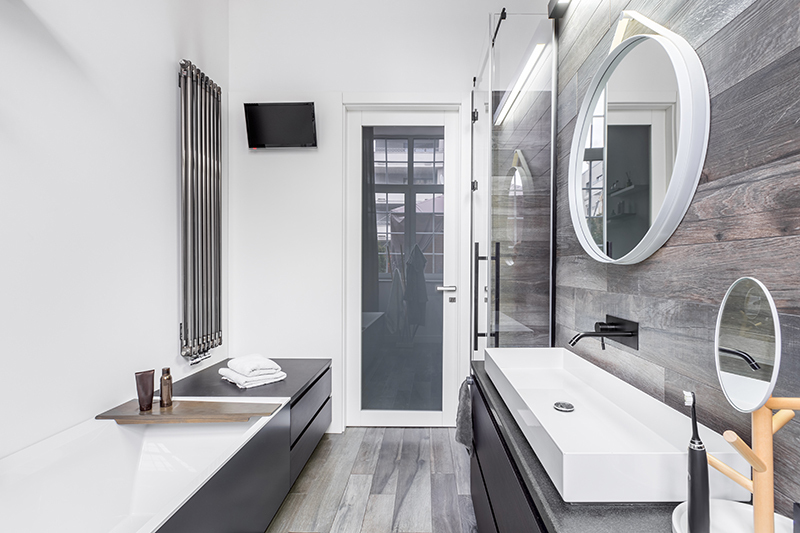 A sliding barn door or a pocket door won’t encroach on your bathroom’s already limited real estate. The added bulk of a full vanity takes up valuable space, so try a pedestal sink instead. You may not have a place for soaps or towels on the vanity, but there are plenty of wall-mounted solutions perfect for bathroom accessories. Even if your walls and ceiling are light and bright, a dark floor will negate their effect and close the space in. Keep the flooring light to create a space with a bright and open flow. Clear glass shower doors make the room appear larger, while frosted glass breaks up the space and makes it seem smaller. The same goes for a frame around the glass. A frame can make the area seem choppy rather than smooth and open. Additionally, install the same shower tile from floor to ceiling. The seamless look from top to bottom adds cohesion and openness. 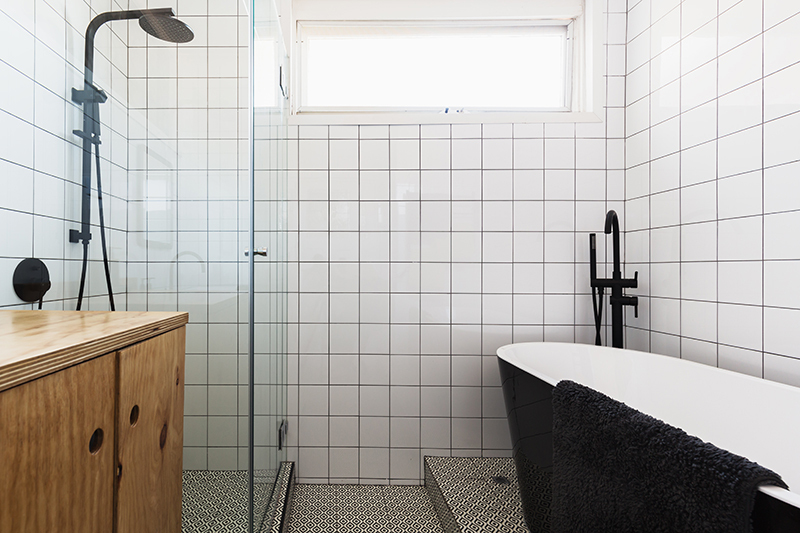 Just a few changes to your small bathroom can make dramatic differences in how open it feels. Once you’ve tried these tips and tricks in the bathroom, apply them throughout your home! It’s all about creating the illusion of space.